-KamLAND: Data from the analysis performed here. -Solar data: We include data from the Homestake chlorine detector (paper), from GALLEX (paper), from SAGE (paper), from Super-Kamiokande (paper1, paper2, paper3, paper4), from SNO (paper1, paper2) and Borexino (paper). For most of these experiments we use the final data samples. From this list the only ones still taking data are Super-Kamiokande and Borexino. The result of our simulation is presented in the following figure. 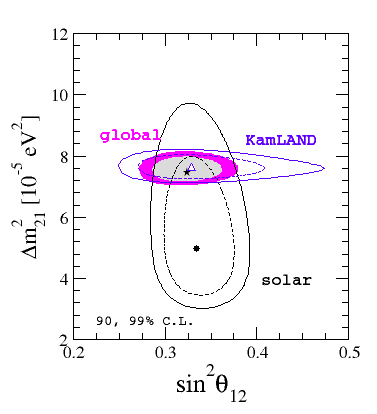 We present the result from the combined analysis of all solar data, the KamLAND data, and the combination of all solar data with KamLAND data.